just a quick post to wish all of you a happy new year :) Hope you enjoy it and make some doable new year's resolutions. I'm sorry I haven't posted a while because I've been awfully busy the last days and the rest of it just plain lazy to upload pics(and I was re-watching the two seasons of True Blood, I'm quite obsessed with this series which reminds me to get the book series- I only read the first one). Plus I just restored my computer because it was quite slow and I haven't install Photoshop yet so it might take some time till I can show you some "fresh"/more recent manicures. 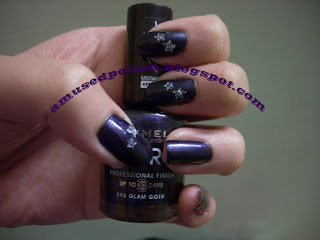 So today's post is about Rimmel Glam Goth- it was realeased in an Le but I don't remember the name together with another lighter purple but I liked this better because I love deep, vampy purples. Here's just a quick post about a recent manicure. My life's crazy right now (so much to do in such a short amount of time). It's 2 coats of China Glaze's Let's Groove and then a coat of China Glaze in Golden Enchantment. I thought Let's Groove wasn't that satisfying to me so I layered an untried polish over it. I love this combination but silly me had to write and do some things when the polish was touch-dry but not all layeres so it pulled up and looked like horrible tipwear. I didn't had many time to do a new manicure so I decided to paint it over. Sorry about that. It's just the last weeks that I've been quite busy and I can't stop working or learning because I've got an test-marathon next week and after that I'm going on vacation for about 3 weeks. As you probably see on today's topic I'm comparing these two colours. It seemed like dupes in the bottle but Ibiza is darker. 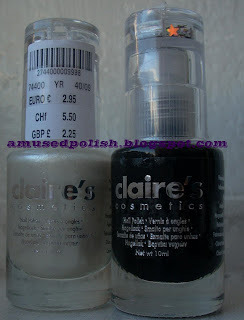 The application on both polishes were nice and I didn't had much problems (just my not so good-application). The pictures show 2 coats each, no Top-Coat. 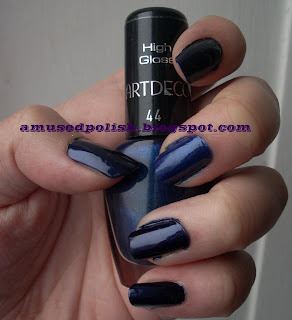 There's a giveaway at painted Lady Fingers and she partnerd up with Diamond Cosmetics. The prizes are a total of 12 polishes and you can choose 8 different polishes from their current color chart. Wow- that's a lot and they don't sell the brand here so fingers crossed. As you probably wondered why this is an golden post. I've done an comparison of a few gold-colours I have. 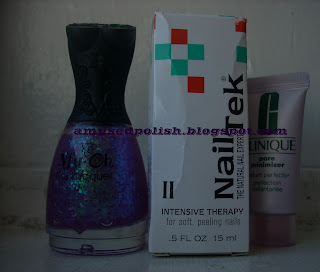 The polishes I used were: Etude House in BR003, Alessandro No. 297, Nivea No. 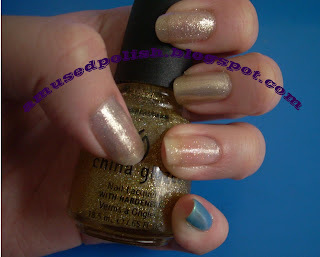 72- Pure Gold and China Glaze's Golden Enchatment. As an extra a polish I haven't swatched before: Etude House in Hologram Blue. I won the two Etude House polishes at happyberrynainad's giveaway which I posted a little haul here. I finally got around swatching those. The Alessandro varnish is from their current Limited Edition called "Be a Star"- there were quite a few great mini-polishes & I've got about 4-5 polishes. Among those is a possible dupe for Opi's Merry Midnight/Sasatinnie 1G9 and a (possible) dupe of China Glaze's Ruby Pumps. - Pure Gold (see how opaque it is? 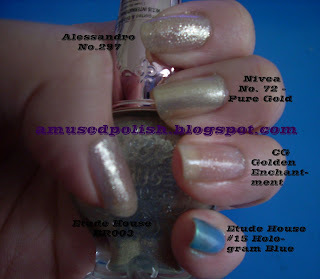 It's great for stamping), one Coat of CG Golden Enchantment and 3 or 4 coats of Etude House's Hologram Blue. 2 coats of EH BR003, 2 coats of Alessandro, one coat of Nivea-varnish, 3 coats of CG and 3 or 4 coats of Etude House's Hologram Blue. a close-up of the final( 2 coats) result of the Alessandro polish. a pic of the Nivea bottle. a close-up of the Nivea-polish swatch. 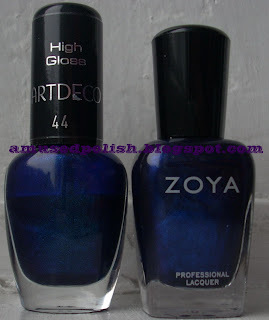 These two pictures shows how great the duo-chrome effect of the polish (how it is more yellow-ish in the one picture and more blue on the other plus the great design of the bottle). Nfu.Oh No. 50,Extras: Nailtek II and a Clinique pore minimizer sample. I sometimes go to Claire's and see what they've got (earrings and polishes). 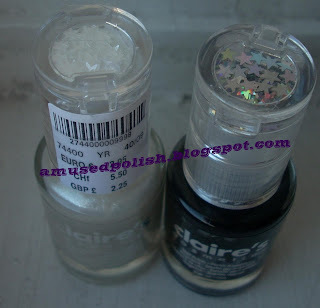 This time these two polishes caught my eye and I know I had to have them- polishes with integraded nail art stars! There are also other shapes (i think those are hearts, not sure about that) but those two shades& stars were my favourite. I think there were 2-3 other colours, one of them was a light-grape colour and another a flashy pink. The white one is actually quite a white cream colour and has got a light silvery shimmer in it. Here's the other part of my little haul: The IQ polishes are a drugstore brand. I suppose the purple one was sold earlier this year (i think it might be during the summer) because I couldn't find them in the usual display. What you can't see in the photo is that it has got tiny tiny mulit-coloured glitter/shimmer in it. The other IQ polish is ( i assume) a new realease. It is a black with turquoise shimmer- might be a possible dupe of Bourjois No. 24 or W'n'W Dream Black Metallic which I posted a comparison NOTD here. And as you probably have seen the last, rosè one is a Dior varnish. It's Rose Boreale from the (newest?) 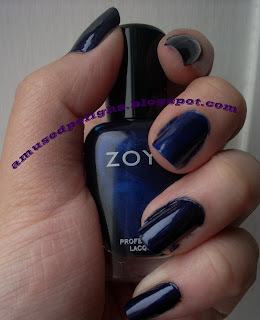 Limited Edition and first saw a great (layered) swatch on Nora's nails from Nail of the Week. f.l.t.r. : IQ Cosmetics Nr. 23 Black Burst, IQ Cosmetics No. 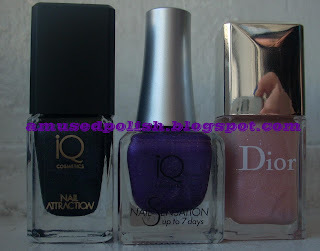 16 Violet and Dior Vernis in Rose Boreal.